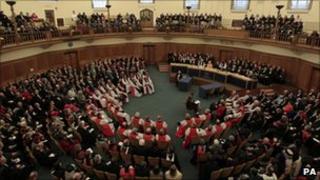 After a special service at Westminster Abbey later, the Queen is to open the Church of England's general synod. The synod gets the honour of a royal inauguration because this is the established, state Church and the Queen is its supreme governor. The synod - the Church's legislative body - is the only institution outside Parliament that can make laws, even if it does have to get its decisions approved by a special parliamentary committee. One of the most important laws likely to emerge in the synod's five-year term starting on Tuesday is the introduction of women bishops. It has already been a debate that has deeply divided traditionalists from progressives, and led some on the Catholic wing of the Church to say they will take up the Pope's offer of a place in the Roman Catholic Church. To many outside the Church - and to some Anglicans as well - so much anguish and dispute over what they regard as a logical progression from the ordination of women priests 16 years ago is unaccountable. But for traditionalists - from both Anglo-Catholic and Protestant backgrounds - there is something fundamental at stake. They point to the growing "feminisation" of the Church as a cause for concern. Since women were first ordained as Anglican priests, they have come to make up almost a third of the Church's clergy. Church statistics show that in the next two decades, no fewer than a quarter of its full-time paid clergy will retire, the great majority of them men. I have known many gay clergy. They've helped me and I'm very delighted to serve in a Church where they feel included. The Reverend Peter Sanlon is the curate of St Ann's in Tottenham, an evangelical church in north London. Last Sunday morning he presided over a family service of lusty singing, accompanied by an electric organ and the vicar on guitar. The worship was informal but the church is socially conservative and Dr Sanlon watches the influx of women clergy with concern. Dr Sanlon understands the Bible as supporting "male headship", a natural role for men as leaders of their own households and the Church alike. He says he would be reluctant to serve under a woman bishop, but his real concern is that the growing influence of women clergy will result in the ordination of openly gay bishops. "While it's not true of every woman, in general more women are supportive of permitting homosexuality," he says. "So in general statistical terms, the more women who are promoted to positions of leadership like that, the greater problem there will be in holding the line and defending the traditional views of morality in that area as well." A few miles away in Primrose Hill, the Reverend Marjorie Brown is one of two women leading the service of Sung Eucharist. Incense billows from a swinging thurible and the clergy wear heavy ornate robes. The vicar insists that women clergy are not automatically liberal, and differ widely in their approach to homosexuality. She does accept that many of them have a natural sympathy for gay clergy, having felt the force of discrimination in the Church for themselves. "I have known many gay clergy," she says. "They've helped me and I'm very delighted to serve in a Church where they feel included. I would like to see the whole Church reflect that Christ-like welcome to all." But some traditionalists insist that the Church's more feminine face is not universally welcoming. Dr Sanlon says he has seen at first hand that some men are discouraged from going to church when women priests are in charge. "The average working-class man doesn't respond as well to a female clergyperson as he does to a man," he says. "That may not be politically correct but it is a fact of life, but the Church is here to serve people as they are, and not to turn them into some sort of politically correct being." The Bishop of Richborough, Keith Newton, a traditionalist on the Church's Catholic wing, supports that view. Bishop Newton, who recently decided to convert to Catholicism because of the way women bishops were being introduced, worries that the absence of parental fathers could be especially damaging. "I have seen research that says if you want children to go to church, dad needs to go with mum. And we've got a real problem with dad going. So church becoming more feminine could be a problem." Marjorie Brown - the first female vicar of St Mary's in Primrose Hill in its 120-year history - has had virtually the opposite experience. She says women have helped make the Church less starchy and remote for both men and women, and brought it closer to the society it serves. If anything, she says, the Church has further to go in creating true equality. "When we're externally paternalistic in our ways about God, we alienate women. Therefore female clergy are trying to find more inclusive language and imagery. We're not trying to change the Church, just to be more inclusive." Although one in every two new Anglican priests ordained each year is a woman, only a minority take jobs like Marjorie Brown's as a vicar of a parish church. Instead many work as chaplains, or unpaid as "self-supporting ministers". But as ageing male priests retire, the influence of women clergy will grow, along with their numbers.